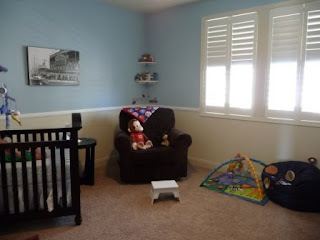 Daddy worked REALLY hard on my room, and I wanted to share the finished product with all of you! He did all of this ALL BY HIMSELF….and he even used a nail gun and a big saw! Uncle Scottie came over to help him with the chair moulding…..Mommy took a deep breath of relief when they both walked out of my room without any nails through their hands! 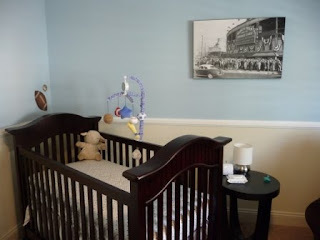 Do you see my picture of Wrigley Field on the wall? Daddy says that’s where his favorite team plays baseball, and that when I’m bigger he’ll take me there. 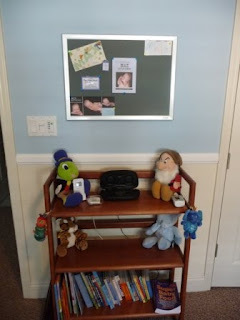 Here’s my bulletin board and my bookshelf. So far I have my birth announcement and Jack’s birth announcement. 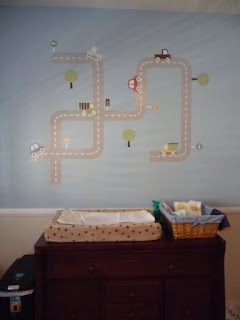 Mommy is going to put Lev’s up soon, and I’m saving three more spots….one for baby Nathan (WELCOME baby Nathan……..Mommy will be posting more about your arrival soon!!! ), one for Caleb’s little brother or sister, who won’t be here until February, and one for Tiffany’s baby, who will be here soon!!! Don’t worry guys, I’m keeping the board open for ya! Here’s my crib…..I totally sleep in here now, because I’m BIG! Daddy painted this mural on my wall…..
Hah Hah….just kidding! They’re decals….but they’re cool, huh?! 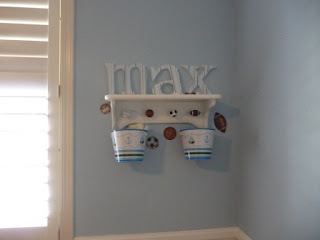 Check out my name hangin’ out on the shelf…. Well folks, that’s it for now. If you ever need someone to decorate YOUR pad, just call my dad!